Join in Samahita Retreat's integrated yoga and functional fitness program, the YogaCoreCycle, where you will be encouraged to work on your optimal health and well-being, not only physically, but also emotionally and mentally. To achieve this balance, all you need to do is integrate your physical, mental, and spiritual aspects in this unique and pioneering world-first program. Samahita was purpose-built to function as a retreat center dedicated to your vitality, well-being, and relaxation. The variety of private and shared room options reflect that. The rooms are set back from the main beachfront facilities perfect for quiet contemplation and relaxation. The eco-friendly buildings make use of cross-ventilation, natural lighting, rainwater harvesting, and offer both mosquito screens, fans, and air conditioning. They have rooms for the single traveler, couples or friends, as well as loft-style accommodation that is ideal for families or two people sharing. Regardless of which room you stay in, the beach, pool, and practice spaces are seconds away. Maximum capacity is two adults, one child. The room has 35 square meters of personal space, including a private balcony. It has a queen-size bed with individual reading lamps and personal built-in shelf space at the headboard. Also included is a large writing desk (2.5 meters), bookshelves, storage cabinet that can be locked and can accommodate large laptops, hot-water kettle, medium-size fridge, built-in wardrobe with sufficient space for luggage, ceiling fans, and air conditioning. There is a fully equipped bathroom with large shower area and room for clothes hanging and drying. Guests can enjoy approximately 25 square meters of personal space, including a private balcony. Room features include a queen-size bed with individual reading lamps, a writing desk, bookshelves, lockable storage cabinet, hot-water kettle, medium-size fridge, built-in wardrobe, ceiling fans, and air conditioning. The bedroom section of these rooms is private and includes a dedicated entrance as well as direct access to a fully furnished bathroom, which is shared between two rooms. This room has approximately 50 square meters of personal space, which includes a private balcony. The room is split-level with a loft. Each bedroom has its own private space. There is a fully equipped bathroom shared by both bedrooms. Some of these rooms are equipped with an outdoor rain shower. Each bedroom has a queen-size bed with individual reading lamps and a personal built-in shelf space at the headboard. Also included are a large writing desk, bookshelves, and storage cabinet that can be locked and can accommodate even large laptops, a hot-water kettle, and a medium-size refrigerator. The loft also has two wardrobes with sufficient space for luggage, two ceiling fans, and air conditioning. Samahita’s signature program is designed to offer your body and mind an integrated yoga and functional fitness approach. The program offers a level of activity and rejuvenation that covers all aspects of human functioning across yoga asana, both Dynamic and Restorative, meditation and breath, core strength and cardio workouts, combined with delicious and healthy food offering. What is on offer through the YogaCoreCycle program encourages you to achieve optimal health, not only physically but also emotionally and mentally. All that is needed is your engagement and participation, most of which happens directly at the beach! The full program is automatically included when you book your stay at Samahita Retreat, with the option to take all five hours of classes every day or choose as per your need. Conceived and developed by Paul Dallaghan, Samahita’s founder, with input by athlete trainer and movement expert, Arielle Nash-Degagne, it is grown out of Samahita Retreat's long-term (over 40 years) experience in the world of yoga, meditation, health, and fitness. A common question is: can yoga and fitness activities work together and be merged? Absolutely yes! Yoga is supportive of many areas in one’s life and though offering many physical benefits it is not designed to fulfill one’s work out needs. Your evolved human body needs a variety of inputs and activities, especially in your current modern, technological world. To understand that alone is, ironically, a part of yoga. Take a look to understand why and how yoga and fitness practices can work together. YogaCoreCycle is a complete program offering that gives you not only great value but the freedom to attend all classes or the ones that suit, whether every day or some days more and some less. You may practice more yoga and skip the fitness or the other way round, but for sure you can do both. As a fully inclusive integrated program, you can take things at your pace while Samahita supports and motivate you to do your best. Samahita has been awarded some of the highest accolades in the teaching and practice of yoga in the world since 2003. They share that learning with you in both Dynamic and Restorative yoga asana classes that include breath and mind work of a full yoga practice. Discover, learn more, or deepen your yoga practice with an aim to practice, understand, and take home a set of yoga techniques. Get in touch with your deep core muscles to support your back, pelvis, and spine. 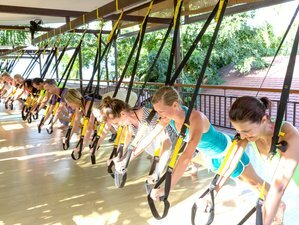 Samahita offers group classes that cover key functional fitness principles in a high-intensity training format. Core strength is essential for health, yoga practice, and a happy life. Enjoy fun, dynamic exercises which integrate foundational body-based core exercises with the top of the range functional equipment including TRX, Bosu, UGI, sliders, kettlebells, grids, toners, flex bands, resistance bands, and Redondo balls. Indoor cycling (spinning) with a direct view of the beach is a fun, mega cardio, fat burning, sweat pumping, fitness building workout. You do not need experience, just your desire to ride. Fortunately, you adjust the resistance and manage your intensity. The dedicated cycle studio looks onto the beach and is stocked with Schwinn’s latest Carbon Blue cycle technology in bikes. In the morning, they offer a silent-sunrise-cycle while in the afternoon it is a music-infused upbeat ride. During this retreat, you can enjoy one boat and snorkeling trip, as well as visits to Lamai and Bophut walking street. Samahita Retreat is located on the south coast of Koh Samui, a tropical island in the Gulf of Thailand that still has long stretches of pristine beaches and unspoiled land. The ideal setting for Thailand holiday packages, it is only about an hour away from Bangkok by air, an hour plus from Singapore, and three hours from Hong Kong. Koh Samui has the allure of a remote island paradise, but with the accessibility of the regions most popular destinations. Situated on Laem Sor beach, Samahita Retreat is surrounded by towering coconut trees in a quiet and spacious area with incredible sunrises and sunsets that play with the colors of the water, sand, and tropical fauna. Only a few hundred meters away is the well-known Laem Sor Pagoda, which houses the remains of Leung Poo Daeng, a realized monk. The only other structures in the area are privately owned villas. As such, Samahita Retreat' beach is private and virtually undisturbed, creating a beautiful, peaceful setting for you to enjoy your Thailand yoga holiday and chosen wellness packages. The main shopping areas are still within easy reach, about fifteen to thirty minutes away by car or motorbike. Samahita Retreat's gentle setting inspires long, refreshing walks on the beach or through the meandering back roads. During this holiday, you will be served daily meals. Samahita Retreat serves mainly vegetarian food with fish dishes three or four days a week. Eggs are available to order and are included in the brunch. Please order them at the juice bar on the days you would like to have some. For those that do not take fish or eggs, there is always an alternative protein option available. Milk is available, as well as home-made rice and soy milk. If you are allergic to certain foods, please notify Samahita Retreat with details. You can also inform the kitchen or wellness staff upon arrival. The kitchen staff can make special meals for you. Samahita Retreat can accommodate vegan and raw-food diets. Every single menu served at the buffet is detailed on the blackboard just outside the dining hall. On it, you will find clearly noted symbols stating if the dish is vegan, contains wheat or eggs, and other information. Samahita Retreat has self-service herbal tea (ginger, lime, and mint) in the Sattva Dining restaurant from 7:00 a.m. to 1:00 p.m., and then again at dinner time from 6:00 p.m. to 8:00 p.m. Coffee is also available in the restaurant from 7:00 a.m. to 1:00 p.m. If you prefer, you can order espressos, cappuccinos, and so on at the juice bar, which will be added to your room bill. Samahita Retreat has taken all the elements of the programs and tailored them to fit and support your fixed date group yoga retreat or teacher training. You can choose from the detox, de-stress, weight loss, or wellness spa programs, giving you the chance to enjoy massages, coaching sessions, and various detoxifying treatments. Combine your retreat with a health or wellness spa add-on program to make the most out of your stay. You are invited you to enjoy rejuvenating massage and treatments at an exclusive rate. Enjoy a 10% discount on the add-on program of your choice. For deep swimming, beaches on the north and east of Samui have less reef protection, with Chaweng’s powdery sands drawing in vast crowds of tourists from around the globe. A hub of shopping, nightlife, and entertainment, this bustling metropolis feels like a million miles from the tranquility of Samahita Retreat’s quiet beach. Silver Beach near Lamai is still reminiscent of old Samui with a few family-run resorts and restaurants and is a favorite for swimming beach with the locals. With over 1,000 feet of bouncy castles, tunnels, slides, and swings, children under eight can burn off steam at Fairways, the island's first soft play center while parents relax in the coffee shop downstairs. It costs 100 THB per child and is open seven days a week. %Children and adults also can get up close and personal with a range of tropical birds and animals at Paradise Park Farm. High on the mountain of Khao Pom with panoramic views of the ocean and tropical jungle, there’s also a playground, infinity swimming pool, and restaurant. As well as being a tropical haven of beaches, five-star hotels, and spas, Koh Samui has a rich Buddhist heritage and is home to many active temples. Only a five-minute walk from Samahita Retreat is the Laem Sor Pagoda. With its shining golden tiles and peaceful atmosphere next to the mangroves and the ocean, you can also visit the remains of Leung Poo Daeng, a realized monk and climb up to the Khao Chedi, high on the mountain with breathtaking views. Wat Kunaram is home to the preserved body of the revered Lung Padaeng, known as the mummified monk as he is still sitting in the meditation position over 20 years after his death. The most iconic Buddha statue on Samui is Wat Phra Yai, or Big Buddha temple not far from the airport, where you can climb the steps up to see the large majestic Buddha. Only a short drive from the retreat center is Wat Ban Plai Leam where you will find is a large selection of intricately designed temples. To discover authentic Thai food not far from Samahita, you can take a taxi ride to Nuch Green Talay in the fishing village of Tong Krut for delicious curries, seafood, and friendly service. For lunch with a view, there is nowhere more magical than the Jungle Club, with tasty food served in bamboo salas on the mountainside overlooking the ocean. For holiday trinkets and gifts, visit the peaceful and traditional port town of Nathon, or the busier bustle of Lamai. The island’s largest tourist hub is Chaweng which is home to miles of stalls and stands selling everything from carved elephants to buckets and spades. Feel free to barter and be aware that many of the clothes and handbags are counterfeit. For beautiful high-quality handcrafted Buddha statues from Thailand and Burma, visit Double Dutch next to Big Buddha temple. Join an organized tour from Samahita and the long tail boats (with shade) will collect you right in front of the shala and whisk you off to the peaceful tropical islands of Koh Matsum and Koh Tan for snorkeling and relaxing. Enjoy the stunning islands of the Anthong Marine National Park on a fun-packed day trip, made famous by Alex Garland as the setting for his novel, ‘The Beach’. You can swim, snorkel, and visit the park headquarters on a beautiful white beach and climb to the viewpoint for a breath-taking panorama, before lunch and a visit to the emerald lake. Discover the best dive sites in the region with the award-winning 100 Degrees East Samui Dive Team on board their 35 feet dive speedboat. See the sights of Samui with Mr. Ung’s full day magical jungle safari. From temples to waterfalls, monkey shows to traditional rubber tapping, these highly professional and experienced guides will show you the best of the island from their iconic four-by-four jeeps. For those interested in learning more about Thailand’s martial art, Muay Thai, visit the Muay Thai camp in Lamai. And if you’re a lover not a fighter and you want to see some Thai dancing, it is available at many of the island's hotels and restaurants. However, the fine dining and romantic atmosphere at Zazen in Bophut is a lovely setting to enjoy this beloved art form. Herbal steam room from 6:00 p.m. to 8:00 p.m.
Samahita Retreat is purposely set up to help you unlock your potential, increase your energy, recover and enhance your vitality, to breathe into a new life.